It makes a great cup of coffee for as little time as 3 minutes!! Even the coffee filter it easy to replace. I have a couple of tips to make a great cup of coffee. The first is you gotta have good water(spring water or reverse osmosis filtered). The second advice is good coffee beans (I recommend - colombian). The third is a good coffee maker(BUNN NHBX-W Contemporary 10-Cup Home Coffee Brewer). A good coffee machine takes into account temperature of the water and extraction time. 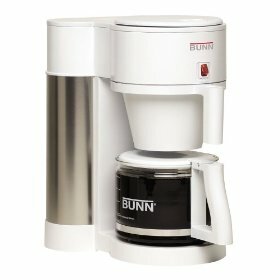 Bunn has made commercial coffee makers for years before the Mr Coffee types hit the market. The home version of their coffee maker has the same high quality. The carafe has a wide open top for ease of cleaning,and the fit and finish is excellent. It makes a great cup of coffee for as little time as 30 minutes!! Even the coffee filter it easy to replace. Now I’m hooked on coffee. Comments for It makes a great cup of coffee for as little time as 3 minutes!! Even the coffee filter it easy to replace. I work for BUNN and just wanted to make a correction to the statement. It takes 3 minutes to brew a full pot of coffee, not 30 minutes.